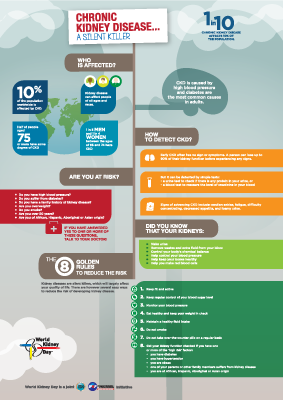 This poster includes infographics about kidneys and kidney disease. Here you can find some facts and figures on Chronic Kidney Disease (CKD) and useful information on how kidneys work and how to keep them healthy. We created this poster with the intent of providing a informative and educational tool that everybody can use and display. You can hang it in hospitals’ waiting rooms, university notice board, etc..
You are most welcome to translate the message to your own language. The way to do this is to use the Adobe reader file (.pdf). This document (.pdf) can be opened and edited using Adobe Illustrator CS5 or later versions.